The name Lazaretto (correct spelling) is believed to have been derived from the Italian dialect of Nazareto after the Church of Santa Maria di Nazaret (eng. Nazareth) at Genoa, Italy where the first lazaret to be established was run by the nuns from 1403. Another was later established in 1476 at Marseilles, France. No connection then with Lazarus as has been popularly assumed. These Lazaretos (Spanish spelling) were essentially quarantine stations for the “plague”. In Great Britain during the XVIII century there was a great deal of concern over the spread of the plague which led to the Quarantine Acts of 1710, 1752 and 1788 being passed by the Government. Britain lost Minorca to the Spanish in 1782 (the end of the second British occupation). It was during that siege that the upper, (above ground), workings of the huge fortress of Sant Felipe were destroyed by the Spanish. The fortress having been under continuous artillery fire with between 80 and 90 shells exploding on the site every hour for 29 days it ended almost as a pile of rubble. 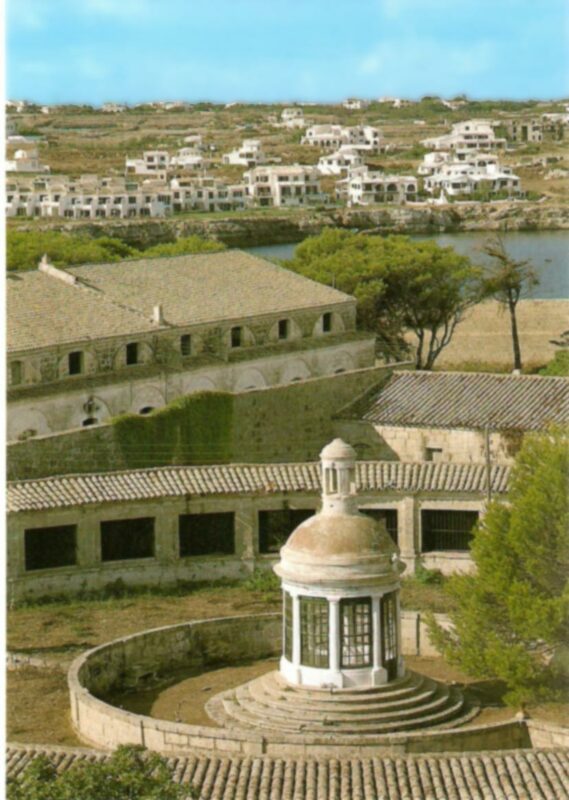 In 1787 the Count of Floridablanca, Charles III of Spain’s Prime Minister gave the order for the construction of such a quarantine station or Lazareto in the Harbour of Mahón. The work did not, however, begin until 1793. 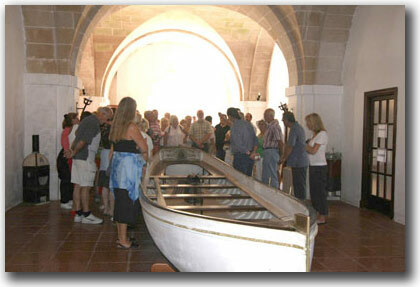 The stone from the ruined fortress was then put to good use and recycled, ferried across the harbour by boat to be used in much of the construction of the quarantine station. This construction was, however, interrupted by the third British occupation of 1798-1802, but completed in 1807. The Lazareto was finally opened in 1817 and was in full use until 1917. The design of the complex can be attributed to the Spanish military engineer Manuel Pueyo. The reason for the sheer size of the complex is perhaps better understood, however, from a British parliamentary paper on quarantine of 1861. ”In Spain the only regular lazaret establishments for the admission of foul arrivals are at Vigo and Port Mahón, such arrivals not being admissible into Cadiz, Barcelona, etc.” In fact Port Mahón served the whole of the Spanish Mediterranean seaboard whilst Vigo covered the Atlantic ports. In Mahón there are two water gates set far enough apart to be out of site of each other and constructed in two totally different styles so that there could be no confusion. The west gate and main entrance is in the traditional Palladian style, the arched entrance flanked by columns surmounted by two rampant lions supporting the coat of arms. 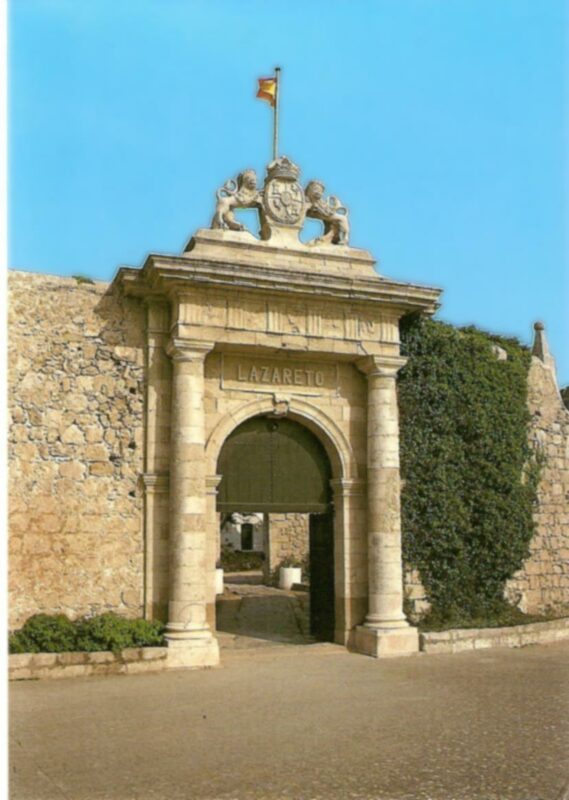 The south gate is in the Luis VI style ornamented above by military trophies. The small land gate at the eastern side is plain in comparison and was of no importance as such, especially after the Sant Jorge canal was constructed in the year 1900, the lazareto peninsular then becoming an island. The double walls at Mahón vary between 18ft. and 24ft. in height and are almost a mile in length. As well as making it impossible to throw objects from inside to outside, or vice versa, the wide corridors formed between the two walls also facilitated the movement of inmates from one area to another in a restricted manner and out of contact with others. The lazareto is separated into various zones for crews and passengers, those merely suspected of disease and others for those actually infected. There is also the area where the medical and ancillary staff would reside, food preparation, laundry etc. etc. Fresh water supply was provided by the several wells on the site and vegetables produced in the gardens. Livestock was husbanded in situ and it is said by the locals that some of the finest lamb on Menorca was produced here. In each zone are beautifully constructed arcaded warehouses where the ships merchandise would be laid out to air and arranged in such a way so that the cargo of each ship was kept separate. Several methods were used to “sterilize” these cargos depending on the type of goods involved. Some were simply exposed to the air, others to the dew and in some cases by fumigation in special smokehouses. One of the interesting and prettiest features of the complex is the chapel. This is like a tiny tempietto and is raised on a stepped platform and glazed so that the inmates taking mass had good visibility of the priest across a strip of no-mans land from the surrounding circular, cell-like, open and bar fronted stalls. The inmates being well separated one from the other and in turn well away from the priest. The Holy wine and bread was passed to the inmates on a very long-handled shovel-like implement so no human contact would be made. As well as plague the lazareto also dealt with yellow fever, cholera and other highly contagious and deadly diseases. The length of quarantine would vary depending of the suspected disease, the part of the world that the passengers and cargos of the boats originated from and the time of year. An example being that if a ship from the Gulf of Mexico left in June or July destined for the southern ports of Spain, the time of the year when yellow fever would be most prevalent (later found to be transmitted by mosquitoes), then on arrival at Mahón it would normally be quarantined until November when the cooler weather helped to stop the disease spreading. A winter departure would need less time in quarantine due to the weather being cooler during the passage and less likelihood of the disease surviving. Time of quarantine would vary hugely from just 3 weeks up to, in some cases, 5 or 6 months. All captains would leave their ports of origin with “papers” showing that the ship and cargo were suspect and would be denied access to any other port until they had passed through the quarantine process. In Mahón once the quarantine had been completed and the ship, passengers and cargo were given a clean bill of health the captain would receive a new set of “papers” from the office in Villa Carlos giving a clear right of passage to any of the mainland European ports. During the century the complex was in operation, (from 1817 until 1917), over half a million people passed through the gates and several thousand died and were buried in the still existing cemetery. The enormous cost of building Mahón’s lazaretto can perhaps be gauged by the £170.000 spent building the lazaretto at Chatham in the early 1800’s. The whole complex still belongs to the Spanish Ministry of Health and is used during the summer months as a holiday hotel for health workers and their families. There are also health related seminars and courses frequently held here and during the past couple of weeks students studying “epidemiology” from EEC countries who have been attending lectures and researching have been using the facilities. Situated outside the main entrance is a statue off great poignancy. Of a man rising up and breaking the chains that had restrained him for so long. Engraved on the 4 sides of the stone plinth are the names of 4 eminent men of medicine and medical science, of Microbiology, bacteriology and immunology, Louis Pasteur, (France), Juan Carlos Finlay, (Cuban), Sir Alexander Fleming, (Scottish) and Edward Jenner English). It was Carlos Finlay who, after years of exhaustive and painstaking studies of Yellow Fever, famously theorized in 1881 that it was a particular specie of mosquito, which transmitted the disease from person to person. His hypothesis was confirmed, some 20 years later, by the Walter Reed Commission of 1900. In the words of General Leonard WOOD, physician and U.S. Military Governor of Cuba in 1900. quote “ The confirmation of Dr. Finlay’s doctrine is the greatest step forward made in medical science since Jenner’s discovery of the vaccination”. The Mahón Lazareto, during its century of working life as such, not only helped stem the spread of various dangerous diseases from other continents into Europe, but dealt with the major outbreaks of Yellow Fever in 1821 and 1870. The quarantine center was finally closed in 1917, in part due to the availability of new vaccines and medicines, but also because of an invasion of MOSQUITOES !! The above mentioned medical scientists and many other men and women such as them, the staff and medics who worked in such quarantine centers, the adventurers and merchants of the 18th, and 19th. centuries, who traveled around the world with courage and at great risk to their own health, who endured much discomfort, to open up international trading and the eventual freedom to travel that we so enjoy today, It is to them that this article is dedicated. El nombre de Lazaretto se cree que es un derivado del dialecto italiano de Nazaretto de la Iglesia de Santa María de Nazaretto . Nazaret) en Génova, Italia, donde se estableció por primera vez el lazareto fue dirigido por las monjas en el año 1403. Otra se estableció más tarde en 1476 en Marsella, Francia. No hay conexión, con Lázaro, como se ha asumido popularmente. Estos lazaretos (ortografía española) fueron esencialmente las estaciones de cuarentena para la "plaga". En Gran Bretaña durante el siglo XVIII hubo una gran preocupación por la propagación de la peste que llevó a las leyes de cuarentena de 1710, 1752 y 1788 siendo aprobado por el Gobierno. En 1787 el conde de Floridablanca, el Primer Ministro de Carlos III de España, dio la orden para la construcción de una estación de cuarentena o Lazareto en el Puerto de Mahón. El trabajo no lo comenzó, sin embargo, hasta 1793. La piedra de la fortaleza en ruinas fue puesta a buen uso y reciclado, transportado a través del puerto en barco para ser utilizado en gran parte de la construcción de la estación de cuarentena. El diseño del complejo se puede atribuir al ingeniero militar español Manuel Pueyo. La razón de la magnitud del complejo es tal vez mejor entendida, sin embargo, a partir de un documento parlamentario británico sobre la cuarentena de 1861. "En España los establecimientos para la admisión de llegadas afectado por peste son de Vigo y el puerto de Mahón, las llegadas de no ser admisible en Cádiz, Barcelona, etc. En realidad Puerto de Mahón fue el conjunto con Vigo, mientras que cubría los puertos del Atlántico y Mediterráneo españoles. Patrick Russell (Tratado de la peste, 1791), escribe "los lazaretos adecuado y puesta en cuarentena, llevado a cabo con regularidad, son el único medio para una nación comercial debería confiar en ellos, para prevenir la infección de la plaga que se trajeron de otros países." Russell considera que un lazareto bueno debe tener una puerta de tierra y dos puertas de agua y que cada puerta de las aguas tiene un muelle por separado "uno para recibir la mercancía desde el buque, y el otro para la entrega de ellos" Él también escribe "una segunda pared a veces se erigió, a una distancia desde el principio ya que es imposible lanzar cualquier paquete o caja "
En Mahón hay dos compuertas conjunto lo suficientemente alejados para estar fuera de sitio entre sí y construidos en dos estilos totalmente diferentes por lo que no puede haber confusión. La puerta oeste y entrada principal está en el estilo tradicional de Palladio, el arco de entrada flanqueada por columnas coronadas por dos leones rampantes apoyan el escudo de armas. La puerta sur es de estilo Luis VI adornado por encima de trofeos militares. La puerta de la pequeña propiedad en el lado oriental es evidente en la comparación y no tenía importancia como tal, sobre todo después de que el canal de San Jorge fue construido en el año 1900, la península de Lazareto y luego convertirse en una isla. Las paredes dobles de Mahón varían entre 18 pies. y 24 pies. de altura y casi un kilómetro de longitud. Como la vez que es imposible tirar objetos desde el interior hacia el exterior, o viceversa, los anchos pasillos formados entre las dos paredes también facilitan el movimiento de los internos de una zona a otra de forma restringida y fuera de contacto con los demás. El lazareto se divide en varias zonas de las tripulaciones y los pasajeros, los presuntos de la enfermedad y otros para los que realmente infectados. También está el área donde el personal médico y auxiliar que residen, preparación de alimentos, ropa, etc., etc. suministro de agua potable fue proporcionada por el varios pozos en el sitio y hortalizas producidas en los jardines. El ganado era abundante in situ y se dice por los lugareños de que algunos de los mejores corderos en Menorca se produjeron aquí. En cada zona están muy bien construidos almacenes donde se envía la mercancía establecida al aire y dispuesta en tal forma que la carga de cada buque se mantuvo aparte. Varios métodos fueron utilizados para "esterilizar" los cargos en función del tipo de los bienes involucrados. Algunas fueron expuestas simplemente al aire, otros para el rocío y en algunos casos por la fumigación en los humeros especial. Russell hizo el punto de que el superintendente de un lazareto debe tener una casa "situada al comando de una vista de todo el recinto". Aquí en el Lazareto de Mahón de un edificio construyó en el centro del complejo, cerca de la pared oriental. Esta se construye en la parte superior de los arcos de alta con el estilo barroco de barrido contrafuertes y aunque no es una casa, como tal, fue de donde el superintendente y sus ayudantes podrían comandar toda la operación del complejo. (Esta bella torre está programada para ser renovado durante el invierno. Una de las características más interesantes y más bonitas del complejo es la capilla. Esto es como un pequeño Tempietto y se levanta sobre una plataforma escalonada y acristalada para que los internos tengan en masa una buena visibilidad del sacerdote a través de una franja de tierra de nadie de los alrededores de puestos de circulares, similares a las células, abierta y de frente de barras. Los internos están bien separados uno del otro a su vez lejos del sacerdote. El vino y el pan Santo se pasó a los internos en un muy largo con mango de una pala-como el instrumento para el contacto humano no se haría. Así como la peste el Lazareto también se ocupó de la fiebre amarilla, el cólera y otras enfermedades altamente contagiosas y mortales. La duración de la cuarentena variará en función de la sospecha de enfermedad, la parte del mundo que los pasajeros y cargamentos de los barcos y se originó en la época del año. Un ejemplo de ello es que si un barco desde el Golfo de México dejó en junio o julio destinados a los puertos del sur de España, la época del año cuando la fiebre amarilla sería más frecuente (más tarde resultó ser transmitida por los mosquitos), a continuación, a la llegada en Mahón, que normalmente debería ser puesto en cuarentena hasta noviembre, cuando el clima más frío ayudó a detener la propagación de la enfermedad. A la salida del invierno se necesita menos tiempo en cuarentena debido al clima más frío que en la probabilidad de pasaje y menos de la enfermedad sobrevivir. El tiempo de cuarentena variará enormemente de tan sólo 3 semanas hasta, en algunos casos, 5 o 6 meses. Todos los capitanes salieran sus puertos de origen con "papeles " de que el buque y la carga fueron sospechosos y se les niega el acceso a cualquier otro puerto hasta que habían pasado por el proceso de cuarentena. En Mahón, una vez que la cuarentena se había terminado y el barco, los pasajeros y de carga se les dio un certificado de buena salud el capitán recibe un nuevo conjunto de "papeles" de la oficina en Villacarlos dando un claro derecho de paso a cualquiera de la parte continental europea puertos. Durante el siglo del complejo estaba en funcionamiento, (desde 1817 hasta 1917), más de medio millón de personas pasaron por las puertas y murieron varios miles y fueron enterrados en el cementerio que aún existen. Todo el complejo aún pertenece al Ministerio de Sanidad español y se utiliza durante los meses de verano en un hotel de vacaciones para los trabajadores de salud y sus familias. También hay seminarios y cursos relacionados con la salud con frecuencia a cabo aquí y durante el último par de semanas los estudiantes el estudio de la "epidemiología" de países de la CEE que han estado asistiendo a conferencias y la investigación han estado utilizando las instalaciones. Una de las hermosas almacenes se utiliza como sala de conferencias, y también muchas cosas de artefactos médicos e instrumentos utilizados durante el período, junto con las calderas de cobre, fumigadores y de una gran importancia de los desfibriladores de corazón una de los primeros (y arcaico) producidos en Europa. Conserva con orgullo aquí y en perfecto estado, es la barcaza real que llevó a la reina Isabel II de España, remando en un 8 Almirantes de la Armada Española, de la ciudad de Mahón por el puerto a los pasos de La Reina a La Mola para la toma de posesión real de la fortaleza que lleva su nombre en el año 1860. Situado frente a la entrada principal hay una estatua de gran patetismo. De un hombre se levanta y romper las cadenas que le habían restringido durante tanto tiempo. Grabado en los 4 lados del zócalo de piedra son los nombres de cuatro hombres eminentes de la medicina y la ciencia médica, de la microbiología, bacteriología e inmunología, Louis Pasteur (Francia), Juan Carlos Finlay, (Cuba), Sir Alexander Fleming, (Escocia ) y Edward Jenner Inglés). Fue Carlos Finlay quien, después de años de estudios exhaustivos y minucioso de la fiebre amarilla, famosa teoría en 1881 que era una especie particular de mosquito, que transmite la enfermedad de persona a persona. Su hipótesis se confirmó, a unos 20 años más tarde, por la Comisión Walter Reed de 1900. En las palabras del General Leonard Wood, médico y EE.UU. Gobernador Militar de Cuba en 1900. citan "La confirmación de la doctrina del Dr. Finlay es el mayor paso adelante dado en la ciencia médica desde el descubrimiento de Jenner de la vacuna". El Lazareto de Mahón, durante su siglo de vida profesional como tal, no sólo ayudó a contener la propagación de varias enfermedades peligrosas procedentes de otros continentes, en Europa, pero tratado con los focos principales de la fiebre amarilla en 1821 y 1870. El centro de cuarentena, se cerró definitivamente en 1917, en parte debido a la disponibilidad de nuevas vacunas y medicamentos, pero también a causa de una invasión de mosquitos! Lo anterior, los científicos médicos y muchos otros hombres y mujeres, tales como, el personal y los médicos que trabajaban en dichos centros de cuarentena, los aventureros y comerciantes de los siglos 18 ª y 19. que la vuelta al mundo con coraje y con gran riesgo para su propia salud, que sufrió mucho malestar, para abrir el comercio internacional y la libertad posible para viajar por lo que disfrutamos hoy en día, es para quien este artículo está dedicado.